A car purchase can expand economic mobility; but tricks and traps in auto financing can lead to harm and abuse. Among those tricks and traps is dealer interest rate markup. Car dealers can add extra interest to a car loan, and keep some or all of the difference. This practice has a long history of unfair and discriminatory impact. CRL research also suggests that borrowers of color are sold more add-on products and are more likely to be told misleading information about their loan. Recent data and settlements show that many auto loans are made without due consideration of ability to repay. Increasing delinquencies in the subprime auto market are a strong indicator of this failure. More regulatory attention needs to be paid to auto loan underwriting. 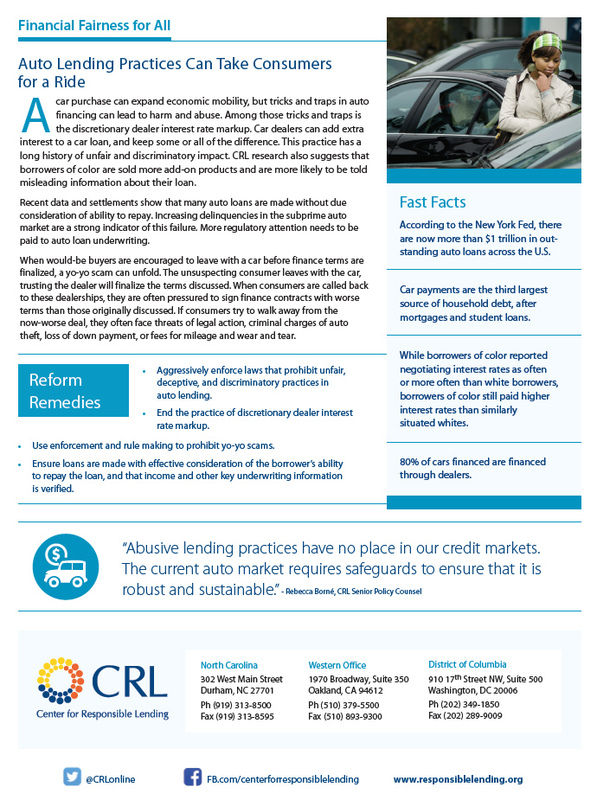 Download the auto lending factsheet. View the rest of the Financial Fairness factsheets.